The Aphidoidea contains most of the extant families and species of aphids. Two additional extant families of aphids, the Phylloxeridae and Adelgidae, can be found in the supefamily Phylloxeroidea. Although the fossil evidence suggests that the Aphidoidea diversified concomitant with the first angiosperms in the lower Cretaceous (approx. 140 MY), it is likely that the family is much older. For example, three groups, the Prociphilini (Pemphigidae), Mindarus (Mindaridae) and Neophyllis (Drepanosiphidae), have what are probably ancient ties to conifers. Therefore 140 MY should be considered a minimum estimate of the age of the superfamily with something over 200 MY a serious possibility. Most aphid families went extinct at the Cretaceous-Teriary (K/T) boundary along with the dinosuars and the majority of extant taxa can be found in the family Aphididae, which underwent a striking radiation in the Miocene (approx. 5-26 MY). There are excellent discussions of aphid fossils and the geological record in Heie (1987, 1994a). This phylogeny was constructed by Heie (1987) based on morphology, fossils and life-cycles. The positions of the two taxa Anoeciidae and Phloeomyzidae are not clear. Heie discussed the difficulties in placing these two taxa and placed the Anoeciidae tentatively as the sister famliy to the Pemphigidae. However, it is likely that the Anoeciidae, which consists of the two very different and seemingly unrelated genera, Anoecia and Aiceona, is polyphyletic. In the literature, some aphidologists refer to the families in the above phylogeny as subfamilies, and the names therefore possess the suffix -inae, rather than -idae. There is no extremely good reason to prefer one categorization over the other and fortunately this dichotomy in the literature has led to little confusion. However, the use of family designations, as above, has the single advantage of allowing slightly more detail in taxonomic hierarchies. Since most of aphid phylogenetics remains unknown, much of the aphid tree must be represented by taxonomic hierarchies and the extra room made available from a promotion of some authors' subfamilies to families is useful for our purposes. Note that this promotion has the effect of promoting some tribes to sub-family status, but these cases are always straightforward and can be recognized by the simple differences in suffixes. Blackman, R.L. and V.F. Eastop. 1984. Aphids on the world's crops: an identification and information guide. Wiley, Chichester. Blackman, R.L. and V.F. Eastop. 1994. Aphids on the world's trees: an identification and information guide. CAB International in association with the Natural History Museum, Wallingford. Dixon, A. F. G. 1985. Aphid Ecology. Glasgow: Blackie & Son Limited. Dixon, A. F. G., P. Kindlmann, J. Leps, & J. Holman. 1987. Why there are so few species of aphids, especially in the tropics. American Nautralist 129:580-592. Heie, O. E. 1980. The Aphidoidea (Hemiptera) of Fennoscandia and Denmark. 1. Fauna Entomologica Scandinavica, 9. Heie, O. E. 1987. Palaeontology and phylogeny. Aphids: Their biology, natural enemies, and control, vol 2A. Eds. A. K. Minks and P. Harrewijn. Elsevier, Amsterdam. Heie, O. E. 1994a. Why are there so few aphid species in the temperte areas of the southern hemisphere? European Journal of Entomology 91:127-133. Heie, O. E. 1994b. Aphid ecology in the past and a new view on the evolution of Macrosiphini. In Individuals, Population and Patterns in Ecology. Eds. S. R. Leather et al. Intercept, Andover. pp. 409-418. Minks, A. K. and P. Harrewijn, eds. 1987. 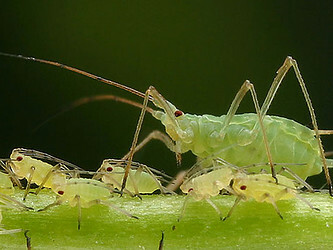 Aphids: Their biology, natural enemies and control. Elsevier, Amsterdam. Moran, N. A. 1992. The evolution of aphid life cycles. Annual Review of Ecology and Systematics 37:321-348.
von Dohlen, C. D. and N. A. Moran. 1995. Molecular phylogeny of the Homoptera: a paraphyletic taxon. Journal of Molecular Evolution. 41:211-223. Page: Tree of Life Aphidoidea. Authored by David L. Stern and Nancy A. Moran. The TEXT of this page is licensed under the Creative Commons Attribution License - Version 3.0. Note that images and other media featured on this page are each governed by their own license, and they may or may not be available for reuse. Click on an image or a media link to access the media data window, which provides the relevant licensing information. For the general terms and conditions of ToL material reuse and redistribution, please see the Tree of Life Copyright Policies.